How much money will you need in Iran? ﷼1,956,608 ($46) is the average daily price for traveling in Iran. The average price of food for one day is ﷼274,883 ($6.53). The average price of a hotel for a couple is ﷼2,924,010 ($69). Additional pricing is in the table below. These average travel prices have been collected from other travelers to help you plan your own travel budget. Located in the Middle East, Iran is part of the South-Central Asian Union, situated between the Gulf of Oman, the Persian Gulf, and the Caspian Sea. The nation is also bordered by Iraq, Turkey, Armenia, Azerbaijan, Turkmenistan, Afghanistan, and Pakistan. Historically known as Persia, the area encompassing Iran has seen conquests of Alexander the Great, the Arabs, and the Mongols, and was famously visited by Marco Polo. Iran is characterized by diverse landscapes such as rugged mountains, high desert basins, forests, and plains along the coasts. Mount Damavand is the highest point, also the highest volcano in the world, while other mountain ranges of Iran include the Zagros Range mainly inhabited by pastoral nomads and the narrower Alborz Range. Most of Iran, however, is covered by two great deserts�the Dasht-e Lut (covered largely with sand and rocks) and the Dasht-e Kavir (covered mainly with salt). Both are virtually uninhabited. Given its varied landscape, Iran is an ideal destination for a wide range of activities including desert treks and excursions, skiing in the mountains, and swimming along the shores of the Caspian Sea and the Persian Gulf. Kish Island in the Persian Gulf has especially popular beaches. Qeshm Island, Iran's largest and the Persian Gulf's largest island, is famous for its wide range of ecotourism attractions such as the Hara marine forests. Qom: one of the holiest cities in the Middle East, considered the "Jewel of Iran"
Some of the best attractions of Iran include sights like ancient cities, historic squares, mosques, shrines, palaces, and museums�all exhibiting unique examples of Middle Eastern architecture. One of the most important historical sites in Iran is Persepolis, which is home to the impressive ruins of a vast city-like complex built over 2,500 years ago, near Marvdasht and the modern city of Shiraz. It was once a Persian capital and is today a symbol of Iranian nationality. Other ancient cities include places like Hegmatane (capital of the ancient Medes), Takht-e Soleym?n (archaeological site), Pasargad (first capital of the Persian Empire), and Meimand (ancient village believed to be one of humanity's earliest remaining places of habitation on the Iranian Plateau), amongst others. Also impressive is the Naqsh-e Jahan Square, located in Isfahan. One of UNESCO's World Heritage Sites, the square includes two mosques and a bazaar and is surrounded by buildings from the Safavid era. Isfahan is also home to a unique music museum which pays homage to Iran's rich musical traditions, showcasing more than 300 instruments from around Iran. The ?l? Q?p? Palace is another attraction of Isfahan, dating from the 17th century with seven floors of beautifully detailed architecture. These attractions and many more make Isfahan the most significant tourist destination of Iran. Meals in Iran are traditionally relaxed, drawn-out affairs with a range of dishes from pastries, fruits, and nuts to rice, kebab, soups, and flatbreads. Lunch can be served anywhere between 12-3 pm and dinner is often eaten after 8 pm. Alcohol is forbidden, except for some religious minorities, as are pork products. Rice is a staple for Iranian cuisine, often flavored with saffron and other spices, and served with kebab variations of chicken, beef, or lamb. Dishes are often garnished with grilled tomatoes, onions, and other vegetables and flavored with a variety of spices. The most popular Iranian soup is the vegetarian ?sh reshteh, made from herbs, chickpeas, and thick noodles, and adorned with yogurt and fried onions. Flatbreads are served at breakfast with herbs, feta cheese, and a variety of jams, or as an accompaniment to meals. 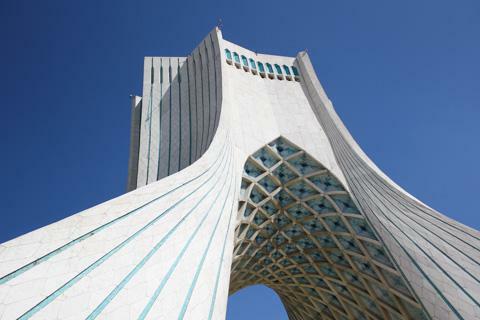 To enter Iran, a visa is required for the citizens of all countries except Lebanon, Turkey, Malaysia, United Arab Emirates, Oman, Russia, Armenia, Georgia, Azerbaijan, Venezuela, Tanzania, Nicaragua, Bolivia, and Ecuador. United States citizens can apply for a visa at the Iranian Interest Section of the Pakistani Embassy in Washington; however, they must have an MFA-approved guide to accompany them for the entire trip as well as an exact itinerary prior to traveling. International flights mainly enter Iran via Imam Khomeini International Airport, located 37 kilometers southwest of Tehran. Iran Air and Mahan Air connect Tehran with some of the major European cities as well as destinations in Asia and Middle East. European companies landing in Tehran include British Midland International, Lufthansa, KLM Royal Dutch Airlines, Alitalia, Turkish Airlines, Austrian Airlines, and Aeroflot. Middle-Eastern airlines include Saudi Arabian Airlines, Emirates, and Etihad.